Especially not one like Anthony Braighton, Earl of Grafton. Raised in America, Anthony sees no reason to marry when he can enjoy all the perks of being an eligible earl. Determined to convince his family he doesn't need a wife, he hires Sylvia to act as hostess and decorator for upcoming parties. Yet Sylvia is as adept at captivating his interest as she is at beautifying his home. And despite this Everton lady's aversion to titled men, some attractions can't be denied—and love rarely does go where it's told. DISCLAIMER 1: This is a stand alone story. You do not need to have read the others in order to enjoy this one. In fact, this is the first novel in this particular series that I have read, I was able to enjoy it and understand it. This may also have something to do with the fact that I met Anthony's sister Sophia in a prior series (another series you do not need to have read beforehand). I didn't love it and I didn't hate it. In fact, I feel like this story had a lot of unrealized potential. The writing style was strong, and the characters were likable. They even had some fun banter between them, but my god if they could just stop with the cliche nonsense. He's an American who never thought he would inherit an English title in love with an English girl who was once thrown over by a man once he gained a titled. And while you can understand and sympathize with her to a point, if they were on good enough terms to call each other by their Christian names, they should be on good enough terms to speak plainly with each other and avoid these guessing games. 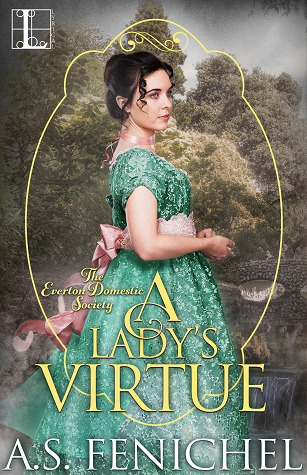 I would also have liked some more information on what exactly the Everton Society is supposed to do considering Sylvia not only redecorates his house, but she also acts as "hostess" aka doing what a wife would do for his other events. It just seemed a bit.... out there. Overall, I think this story will appeal to fans of historical romance, and I would read more from this author! DISCLAIMER 2: I received a complimentary copy of this novel in exchange for my honest review. This has not affected my review in any way. All thoughts and opinions expressed in this review are 100% my own.